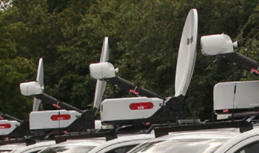 SIS LIVE provides 26 'ad hoc' SNG uplink trucks for UK election. Milton Keynes, UK, June 2017: Broadcast connectivity specialists SIS LIVE today announced that a total of 26 of its ‘ad-hoc’ SNG vehicles will be despatched for multiple UK broadcasters for live coverage throughout the day and into the night of the UK General Election on 8 June 2017. Starting from early May through to post-election results and analysis, two SIS LIVE SNG vehicles on longer term hire have been traversing the UK to provide redundant satellite uplink services for election coverage. 24 trucks have been booked on election day itself, crewed by an equal number of mobile satellite communications engineers plus a few extras for double crewing. SIS LIVE has an ongoing contract to supply 18 contracted SNG uplink trucks for regional news broadcasters and these will be used throughout the elections. David Meynell, managing director, SIS LIVE, said, “We have been making detailed plans and finalising schedules since the Prime Minister announced on 18 April that she was calling a General Election. SIS LIVE will provide ad-hoc satellite capacity of over 100MHz plus and additional 55MHz for contracted news customers. SIS LIVE’s network operations team are on hand as usual 24/7 ensuring all feeds are managed and monitored.